Permaculture design Certificate Course begins january 9th. See our educational listings. The 11th Annual Seed Celebration & Swap will be held on Saturday, February 6! At the compost bins in the Farm Garden in Washington Park. 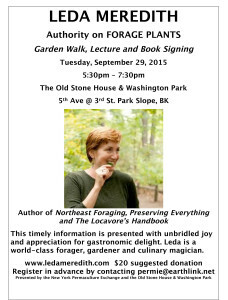 See how one of the nicest mid-sized systems in NYC operates with NYBG Compost educator, Claudia Joseph. Learn how to make premium compost in urban circumstances. Afterward, stroll the OSH gardens to see the emerging useful plants for food, medicine, craft, birds, butterflies & bees. It is all possible because of COMPOST! Learn the benefits and how to’s. $10 suggested donation. None turned away for lack of funds. Rain or Shine, dress appropriately. This annual event brings together gardeners of all stripes to engage in the traditional activity of trading seeds. Our seed heritage is as old as our love of great food and Brooklyn gardeners are savvy to the benefits of top quality, organic seeds. Heirloom varieties of tomatoes, lettuce, and root crops as well as more esoteric and ethnically diverse items such as asian greens and amaranth will be featured. The beautifully packaged Hudson Valley Seed Library seed will be available for purchase as well as selections from Fedco’s politically correct line of non-GMO seeds. Treasures from the Old Stone House gardens will include native flowers that support bees and butterflies. Demonstrations on starting seed and transplanting seedlings, sprouting greens, seed cleaning, making seed balls, and how to make compost will be running at tables throughout this event. Plenty of gardeners will be available to answer your garden questions.This event is suitable for both children and adults. Zach Pickens wil discuss the differences between open pollinated, hybrid, and GMO seeds, seed saving, and the unique aspects of urban cultivation at 10am to begin the event. 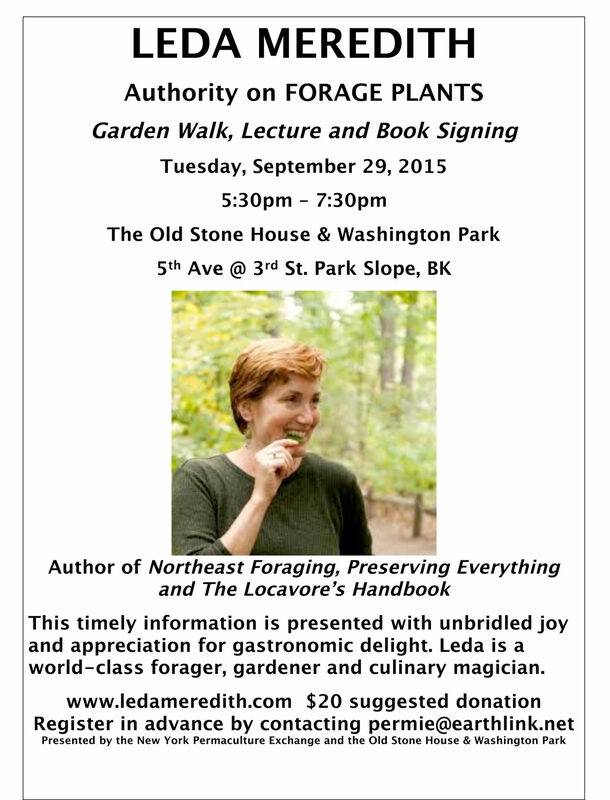 The Park Slope Permaculture Guild: The Permaculture-Exchange was founded in 1998 by Claudia Joseph, a permaculture teacher, consultant and community gardener, to facilitate the free exchange of ideas, materials and labor pertaining to permaculture and its basic principles of care, respect and fair share. As the Director of Environmental Programs at the Old Stone House, Claudia has designed and installed a permanent useful landscape with students, apprentices and volunteers as well as programs and events that promote community sustainability. Ms. Joseph has offered Permaculture certificate programs since 2001 and also teaches Organic Landscaping Techniques at the New York Botanical Garden. 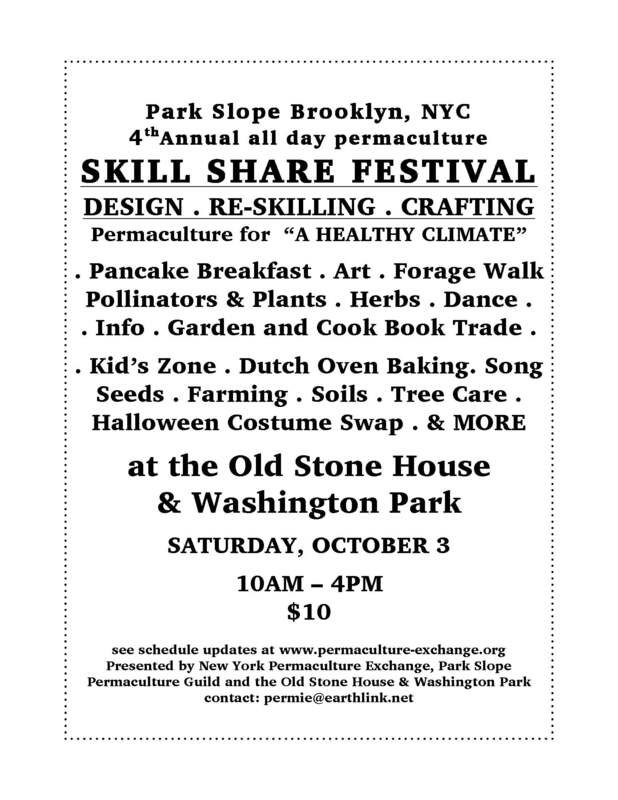 The Park Slope Permaculture Guild supports permaculture actions and relationships in our community and hosts 2 events each year, the Fall Permaculture Festival & Skill-share and the Spring Seed Celebration & Swap. The useful landscape is still going strong at the old Stone House. See what vegetables thrive in cooler weather ad learn about compost, mulching and soil development. Great soil is the secret to healthy, low maintenence gardens – caring for the beds now will make next spring a snap. The perennial gardens at OSH offer opportuities to prune and propagate – the benefits of permanent, food baring plants are numerous. On August 29th, 30th & 31st, 2014 the first North American Permaculture Convergence was held at Harmony Park, a 40-acre outdoor events venue in Clarks Grove, Minnesota with a permaculture installation and on a gorgeous lake. Permaculture professionals and practitioners of all ages connected with their peer group to make this first continent-wide convergence an historic event.